Dr. Geck on KVUE Austin: "Austin spine surgeon, helps give scoliosis patients their active lives back"
Watch video above to see how Dr. Geck helped Taylor recover from her spinal curve with minimally invasive scoliosis surgery. "It would get serious enough for me to fall to the ground," says Taylor. After minimally invasive scoliosis surgery to correct her spinal curve, Taylor is back on the Varsity Cheer team and recently competed in the Miss Texas Teen USA Pageant. News story feature by JIM BERGAMO / KVUE News and photojournalist Michael Moore.Click here to read the story on KVUE Austin. The Becker's listing is comprised of spine surgeons leading scoliosis development nationwide. Dr. Geck is one of only 3 or 4 surgeons in the country to perform truly minimally invasive scoliosis reconstruction, bringing the minimally invasive spine surgery movement to scoliosis surgery in the Southwest United States. These techniques can be used in children, adolescents, and adults. This philosophy is focused on a single, posterior, minimally invasive approach for reconstruction of spinal deformity whenever appropriate. Click here to learn more about Dr. Geck. Click here to view the complete Becker's list of spine surgeons focusing on scoliosis development. This Becker's Spine Review list is compiled through a lengthy research and review process. The editorial team starts a master list of facilities or individuals based on national rankings or original research. The lists compiled without a nomination process are essentially considered "lists of lists," which highlight institutions or individuals that are consistently lauded by other industry ranking companies. Each list is vetted through a panel of industry experts. These experts provide feedback on the chosen entries and note any oversights prior to publication. Dr. Matthew Geck has been named to the Becker's Spine Review list of Spine Surgeons Leading Charitable Care Efforts. Click here to download the complete list of spine surgeons leading charitable care efforts. Dr. Geck is the co-chief of the Seton Spine and Scoliosis Center in Austin, Texas. He is also the founder and medical director of SpineHope, a charitable organization for advancing spine treatment to underprivileged children around the world. He has a professional interested in minimally invasive scoliosis reconstruction. Dr. Geck is also an active researcher of minimally invasive scoliosis reconstruction, surgical planning and complex osteotomy surgery. He earned his medical degree from the University of Wisconsin Medical School and completed his residency at the University of California Los Angeles Medical Center. Dr. Geck also completed an adult and pediatric spine surgery fellowship at the University of Miami's Jackson Memorial Hospital and Miami Children's Hospital. Becker's Orthopedic & Spine Review features news and analysis on business and legal issues relating to orthopedic and spine practices. Each issue of the quarterly publication reaches an audience of 12,500 key ASC-industry orthopedic and spine practice decision-makers including orthopedic and sports medicine physicians and surgeons and spine practice administrators. 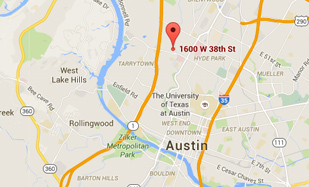 Dr. Matthew Geck is a fellowship-trained spine and scoliosis surgeon in Austin, Texas. Dr. Geck has been using the minimally invasive procedure known as Vertebral Body Stapling for the treatment of spinal curvatures (scoliosis) for the past 2 1/2 years in the Austin region. The treatment is best suited for patients 9-13 years old with spinal curvatures of 25 to 35 degrees. Using a very small incision, a memory medal is placed in the spine which can help straighten the spine while retaining normal motion. The treatment has high success rates, with about 80% of patients seeing either stabilized or improved results after 2 years. Click here or select the image to the left to listen to Dr. Geck talk with Perry Watson of KLBJ. This media clip used courtesy of Radio Station, 590KLBJ, in Austin,Texas. Dr. Matthew Geck has been named to the Becker's Spine Review list of Spine Surgeons Performing Minimally Invasive Scoliosis Surgery. Dr. Geck is the co-chief of Seton Spine and Scoliosis Center and has a professional interest in minimally invasive scoliosis reconstruction. He was among the first spine surgeons in the southwestern region of the country to perform a minimally invasive technique and the first in central Texas to perform and integrate ScoliScore genetic testing into his practice. In addition to his clinical practice, Dr. Geck is actively researching minimally invasive scoliosis reconstruction, surgical planning and complex osteotomy surgery. Dr. Geck is also the founder and medical director of SpineHope, a charitable organization for advancing spine treatment to underprivileged children around the world. He is a fellow of the Scoliosis Research Society and member of the Cervical Spine Research Society. He earned his medical degree at the University of Wisconsin Medical School and completed his residency at UCLA Medical Center. He also completed an adult and pediatric spine surgery fellowship at the University of Miami/Jackson Memorial Hospital and Miami Children's Hospital. Dr. Matthew Geck has been selected as a Spine Surgeon Leader to Know by Becker's Spine Review. Click here to visit the Becker's Spine Review site and read more about Dr. Geck. Becker's Orthopedic & Spine Review features news and analysis on business and legal issues relating to orthopedic and spine practices. Each issue of the quarterly publication reaches an audience of 12,500 key ASC-industry orthopedic and spine practice decision-makers including orthopedic and sports medicine physicians and surgeons and spine practice administrators. Dr. Matthew Geck is the Co-Chief of Scoliosis Texas in Austin, Tx. Click here to read more. 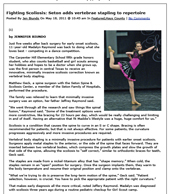 Dr. Geck performed minimally invasive scoliosis surgery on Libby to correct a 62º spinal curve in November of 2011. After surgery, Libby's scoliosis curve was corrected to 14º. Read Libby's success story here. In the spring of 2012, Libby qualified to compete in the tumbling event at the 2012 USA Gymnastics Tumbling & Trampoline Junior Olympics National Championships in Long Beach, California. The competition took place from July 4 - July 11. 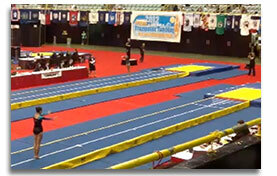 The photo to the left shows Libby during the competition where she earned the Silver Medal! Congratulations Libby! Evening of Hope Fundraiser a Success — Thank you! The Evening of Hope Charity Fundraiser on Saturday, September 8, 2012 was a success! Thank you for your donations. View event photos here. Your generosity helps SpineHope transform the lives of children worldwide through spine surgery, education, and research. 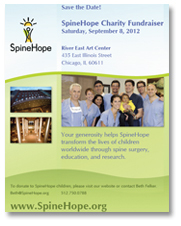 To donate to SpineHope children, please visit our website or contact Beth Felker. Dr. Matthew Geck is the Co-Founder of SpineHope, a non profit organization that transforms the lives of children with spinal deformities worldwide through surgery, education and research. Dr. Matthew Geck has two research projects accepted for presentation at the International Meeting for Advanced Spinal Techniques in Turkey in July 2012. 1. Occipital-Cervical Instability in Morquio-Brailsford’s Disease (MPSIV): A cohort of 16 patients treated in the SpineHope/Casa de Colombia global outreach clinic. 2. Posterior, Single Approach, Two or Three incision Mini Open Correction and Fusion for AIS. Click here to learn more about about minimally invasive scoliosis surgery. Read patient success stories here. Dr. Matthew Geck is only the third surgeon in central Texas to be accepted into the Cervical Spine Research Society. He was accepted into the society in February of 2012. The spring SpineHope trip to Cali is scheduled for May 26 through June 1, 2012. “Vertebral body stapling is a new minimally invasive procedure for patients with early onset scoliosis," the surgeon at Seton Spine and Scoliosis Center in Austin explains. "Using this procedure, the surgeon applies metal staples to the front side of the spine between two vertebrae, which compress the growth plates and slow the growth of that side of the spine, allowing the scoliosis curves to correct themselves naturally, similar to orthodontic braces for teeth,” explains Dr. Matthew Geck, scoliosis surgeon. READ MORE by downloading the PDF from the Hays Free Press. Reprinted by permission by Hays Free Press. As a well respected scoliosis and spine surgeon, Dr. Geck is frequently asked to speak at conferences and meetings of spine care professionals. He is also a resource for news organizations doing stories on scoliosis and spine conditions. Click HERE to listen to a piece about Dr. Geck that recently aired on NPR. Dr. Matthew Geck shares educational videos and information on spine and scoliosis procedures.